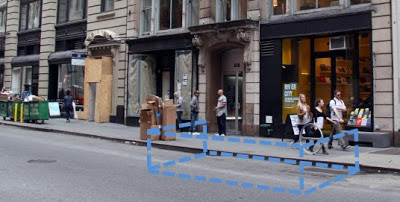 Now in 2013 , the Van Alen Institute has proposed a seasonal parklet in front of their bookstore. Why is Van Alen a great steward for a Street Seat? 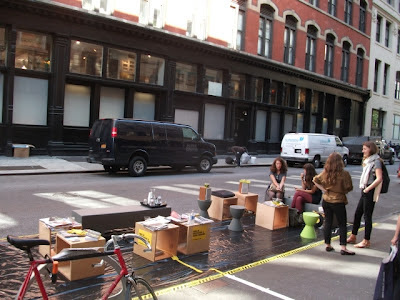 Van Alen’s mission and connection to design communities, as well as the general public on a local, national, and international scale, makes us an ideal partner for a DOT Street Seat. Our mission is to catalyze design innovation in the public realm, and a Street Seat offers a platform to extend the work we do to enhance our local community. We're all for tying these spaces together. 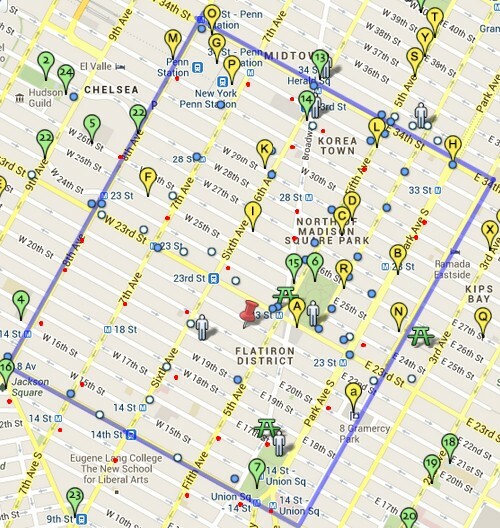 Along with the recent installation of 10 Citibenches in Midtown South (white dots below) installing more parklets like the Van Alen Parklet (red pin below) are a key element in our plan for the creation of an Age-Friendly Midtown South. that offers area seniors a place to sit outdoors within a 3 minute walk of anywhere they are in the area.